Patients are given a narcotic prescription for pain relief, but most patients typically take only a few pills for their entire postoperative course. The eyelid surgery is uncomfortable but not truly painful. Dr. Portuese does not wish for patients to take any ibuprofen or aspirin for the first two weeks postoperatively. Extra-Strength Tylenol is acceptable to take instead of narcotic pain pills. Pain associated with a blepharoplasty is usually very mild and is more associated with a burning sensation, tired eyes, or a headache. Swelling: Patients can expect swelling of the eyelids to last for approximately two to three weeks after their surgery. Surrounding tissues including the sclera, which is the white part of the eye, can be swollen for upwards of two weeks as well. This is similar in appearance to conjunctivitis or pink eye and can last two to three weeks. A majority of the swelling usually subsides at about two weeks after the surgery. There is still an additional 10% of swelling that still needs to take a month to two months to go away and full healing is two to three months. Bruising: Bruising usually occurs in the upper lids and lower lids and into the lower cheeks and lasts approximately 7 to 14 days after the surgery. Bruising depends upon the patient; some patients get a lot of bruising and some patients hardly get any. Irregularities of the skin are the most common occurrence after a blepharoplasty surgery. Patients can get little white heads, which need to be opened up, along the incision line on the upper lids. Sometimes these can actually turn into small pimples and have to be drained. Bleeding: Excessive postoperative bleeding can occur after a blepharoplasty, which is very rare. If this should occur, the incision would have to be opened up and cauterized and the incision re-sewn together. Asymmetry: This is a result of preexisting asymmetry where one eyelid is higher or lower from a natural asymmetry. Infection is extremely rare after a blepharoplasty. 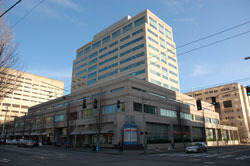 The first post operative appointment is when patients return to Dr. Portuese’s office at the Seattle Eyelid and Blepharoplasty Center approximately one week after the surgery. Examination of the upper and/or lower eyelids is performed and the incisions are cleaned by Dr. Portuese. He will make sure that all tissues on the upper and lower lids are healing quite well. He will make sure that your vision is intact. The upper and lower eyelids tend to be quite swollen, puffy, and bruised. At this point, about 7 – 10 days, patients can start applying makeup to their eyelids if they desire so that they can get back out into their work environment. Dr. Portuese stresses that it takes approximately several months for the full healing process to take effect, and he asks patients to be very patient with regard to the healing of their new eyelids. The goal of the Seattle Eyelid and Blepharoplasty Center is to fully educate patients and to prepare them for what is often a lifetime dream of changing their eyelids to match how they feel. 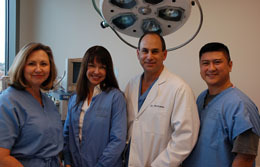 Dr. Portuese and his staff have performed thousands of successful blepharoplasty surgeries. Eyelid surgery is one of the most gratifying surgeries for Dr. Portuese and his patients and staff, and we look forward to taking good care of the patient through this process.